You’re tired and you get in bed early, and yet, you can’t sleep at all, lying there for hours. We all know the feeling, and often, stress and anxiety keep your mind buffeted by thoughts all night long. Not-so-fun fact: did you know that according to a recent consumer reports survey, 68% of Americans have trouble falling asleep at least once per week? And half of these people reported having trouble falling asleep every night. An awful lot of people have trouble sleeping, and they often end up taking a pill. But relying on chemical aids may be bad for you in the long run, and it’s definitely meant as a last measure agains insomnia. Weighted blankets are a simple, if a bit strange, tool that, for some reason, works in reducing anxiety and helping you sleep. 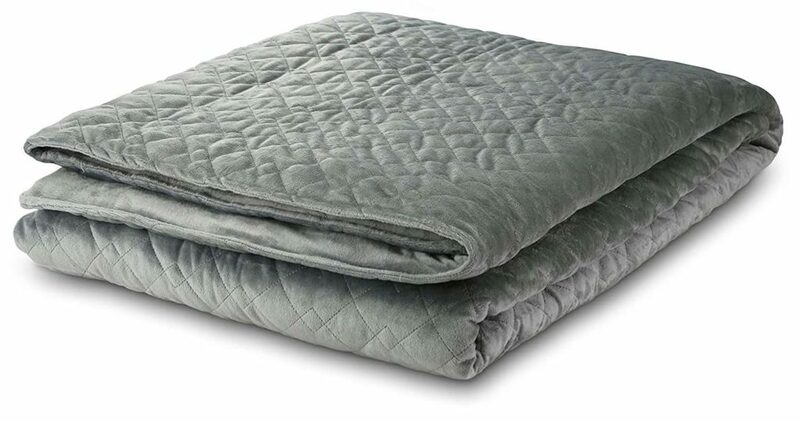 So, I decided review the top weighted blankets on Amazon and log the effort, to find the best one for my needs, and maybe help you find the best one for you. 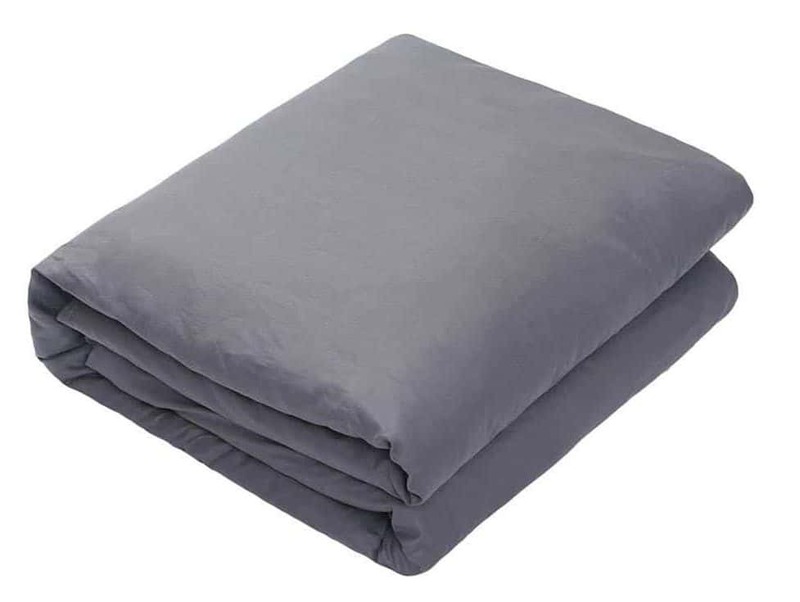 A weighted blanket—also known as gravity blanket—is a special type of blanket that is weighted with little polypropylene beads, sewn inside of pockets throughout the blanket to evenly distribute their weight. When you get under the blanket, the weight of these beads applies a gentle but firm pressure to your entire body. This results in what I can only describe as a feeling of protection and coziness, almost like a giant hug. Oxytocin is the hormone responsible for the feeling of bonding and trust in humans, so basically that good feeling of protection. But I think there’s more to gravity blankets than that: the distributed pressure makes you feel “conscious of your body”, offering a nice detachment from your thoughts. It may be a stretch, but they could almost be a tool for mindful meditation. Your being aware of your body can calm your thoughts, reconciling yourself with the baseline of your conscious experience. Or maybe it just feels good to be enveloped in a giant hug. It is important to make sure you get the right size and weight blanket for your body. Manufacturers all seem to pretty much agree that at most 10% of your body weight is the ideal for maximum soothing and comfort. For example, if you weigh 150 lbs, choose a weighted blanket at or under 15 lbs. Too much and you’ll find yourself emerging from under the blanket pretty often, which is not what you want in theory. It’s of course not recommended to use a weighted blanket for babies, or children under the age of 2. Makes sense, right? Children older than 3 however, are reportedly experiencing major sleep improvements using these heavy blankets. In kids with ADHD, the onset of symptoms may appear as early as 5 years old, and a weighted blanket is definitely worth a try. Note: I would strongly urge you to read more on the matter if you’re considering a weighted blanket for this specific use case. It’s always better to get a blanket that’s too big, rather than one that’s too small. That’s especially true for weighted blankets: say you’re in bed with your partner and your blanket is just a little small for both of you. Because it’s so heavy, the blanket will fall off your body and will end up creating a heavy barrier between you and your partner. No fun. Get a big one so that both of you can fit under it comfortably. Another important consideration is of course the material it is made from. There are a variety of options, from plush to polyester. Washing a weighted blanket is tricky business: in theory, you have to wash a weighted blanket in cold water and air dry it. Or, if you’re the adventurous type, tumble dry on low heat. Always wash it by itself and no fabric conditioner! Pro tip: if you have a very colorful gravity blanket, add a cup of salt to its first wash. This will keep the color from running. I would say that if you care about durability, definitely try to wash your blanket as little as you can. Will My Weighted Blanket Make Me Too Hot? If you’re afraid your weighted blanket may make you too hot, bear in mind that most weighted blankets are actually “thinner” than you think: they look like duvets but they feel like single-ply blankets basically. On top of that, getting a weighted blanket with glass beads (as opposed to plastic beads), will ensure that you won’t overheat under it. The YnM blanket (#9 below) is probably your best bet if you tend to run hot. So these are my top picks for the best weighted blanket on the market (as of 2019). Check out the weighted blanket reviews for each one. The Magic Weighted Blanket is numero uno on this list simply because it feels amazing. If you’ve ever felt Chenille, you probably immediately wished al the blankets your owned were made from this. Its super soft, lightweight, and breathable and super comfy. This brand is also one of the original weighted blankets, and has been featured on Forbes and Dr. Oz. Hurray! 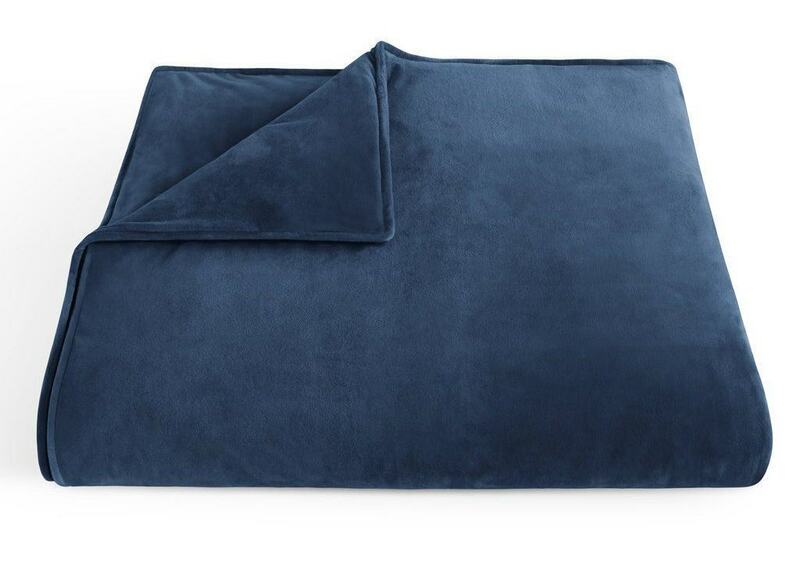 The Magic Weighted blanket comes in 5 chic color options, and ranges in size from 24 x 30 in up to 54 x 78 in. You can choose from a blanket weighing 4 lbs up to 24 lbs, so basically for children all the way to adults. 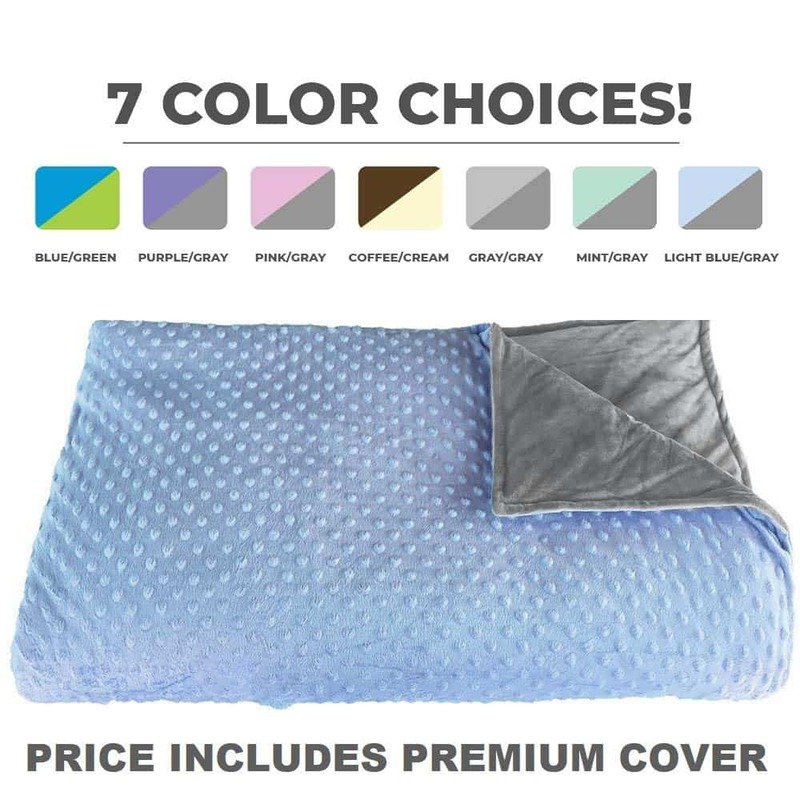 These are also some of the best looking weighted blankets because they have invisible stitches, so they look just like other popular Chenille blankets. The Premium Weighted Blanket for adults by InYard is a comfy tufted comforter, perfect for all weather types. Its made in the USA (says right there in the picture), and it’s a great option for younger kids. The InYard blanket comes in sizes 36 x 48 up to 41 x 60 in and in weights of 4-10 lbs. Two colors: a cool navy blue, or a fun safari print. The navy blanket is fleece on one side, with polyester on the other, and the safari print is all cotton. The navy blanket is a better pick if you live in a cold weather climate, while the cotton feels a bit cooler. 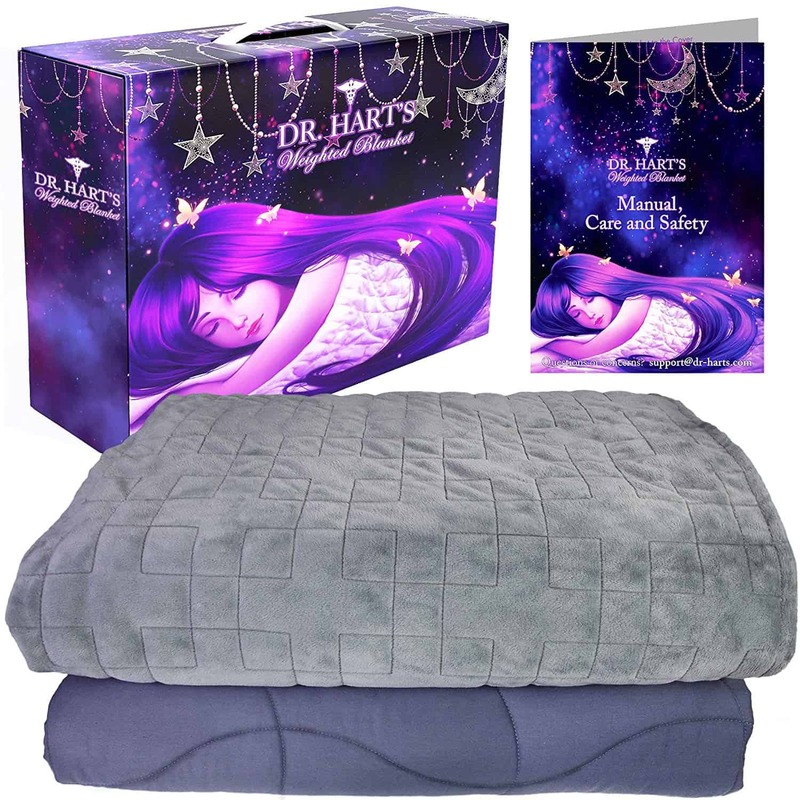 The Dr. Hart’s weight blanket deluxe set is one of the most unique products of it’s kind on the market. The blanket features a new patented “ContourWave design” to fit perfectly to your shape. What does that mean? This blanket will optimize the gentle pressure from your blanket and distribute it evenly to the entire body for maximum comfort. It’s the first weighted blanket to aim as a “one size fits all” for all adults. It’s got a large 60 X 80 inch size, perfect for both individuals and couples. The great thing about the deluxe set, is that it comes with a weighted blanket, and a luxuriously soft cover. But that’s not it, the kit also comes with a coupon to redeem a free cotton cover of your choice, perfect for those warmer months. 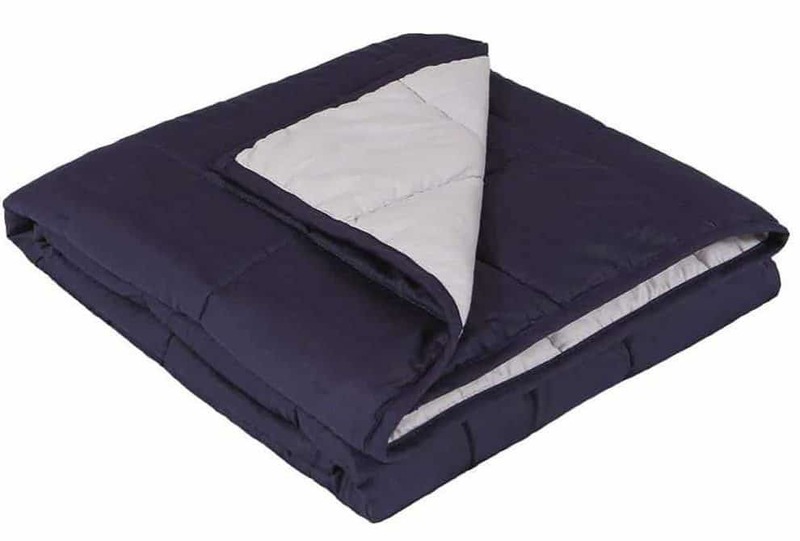 The NAP weighted blanket by Brookstone is a favorite of many because of its NapSoft fabric. This material is super soft and feels great. 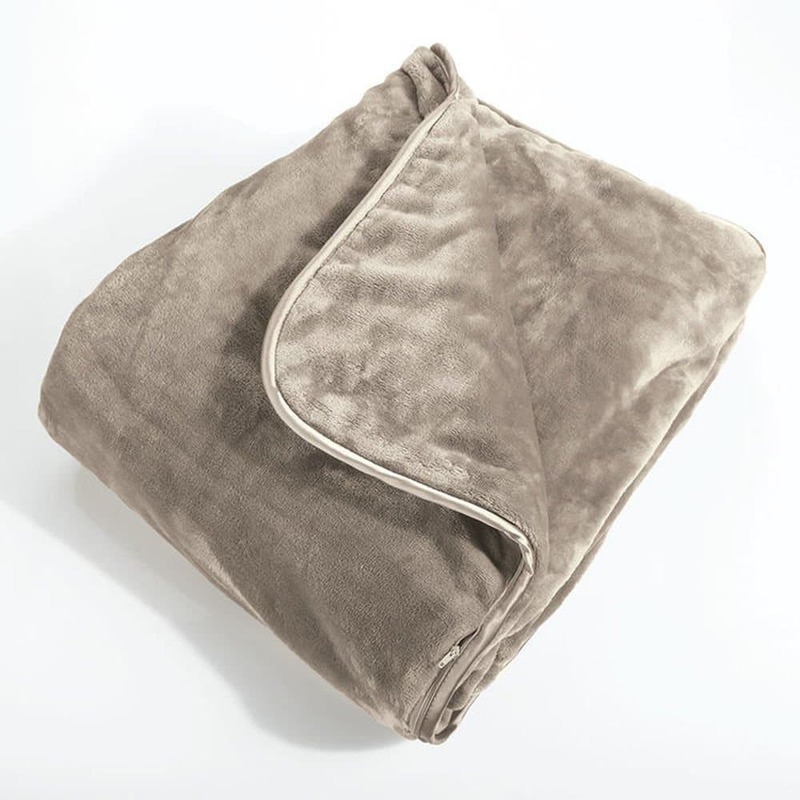 This Brookstone weighted blanket measures 54 x 72 in, and comes in a gorgeous champagne color that will compliment all decor. Not kidding. This blanket weighs 12 lbs, so it’s best for those weighing over 120 lbs. It also has a convenient machine washable cover that makes it easier to keep clean. This definitely scores the NAP weighted blanket some extra points for durability. Sensory goods makes a quality line of weighted blankets in a ton of color choices, sizes, and materials so there is something for everyone. They even have a 100% organic cotton blanket which feels amazing. These blankets have also been featured on NBC’s show Parenthood. Huzzah! Sensory goods weighted blankets come in sizes ranging from 30 x 48 in up to 41 x 72 in and, and the weights range from 4 lbs to 20 lbs. They also come in materials such as flannel, fleece, and cotton so you can fine tune the level of heat your blanket will retain. They’re still good though, since they have a removable case, which is also made out of very soft, minky cuddle fabric! The colors are more pastel-like calm-your-brain type, which I actually prefer to the crazy fuchsia of some of the other blankets. These blankets range in size from 40 x 30 in up to 72 x 54 in, and come in weights from 5 to 25 lbs. They are some of the most comfy I’ve tried, but the fabric is pretty hot, so if you get hot at night, maybe you should try something made out of cotton instead. The Sensa Calm blanket is the has “added puffiness”. What I mean is that it’s got some sort of padding in the segments containing the beads, making the sensory stimulus very enjoyable. It comes in three color combinations, with a contrast border which is pretty neat-o. Sizes from 40 x 30 in up to 72 x 54 in and weights from 5 lbs to 25 lbs. The Sensa Calm Blanket’s tufted pattern evenly distributes the weight perfectly throughout the blanket. Which I think is helped by the padding. This also prevents the blanket from sliding off the bed during the night. And boy, that pillow soft texture is amazingly comfortable. 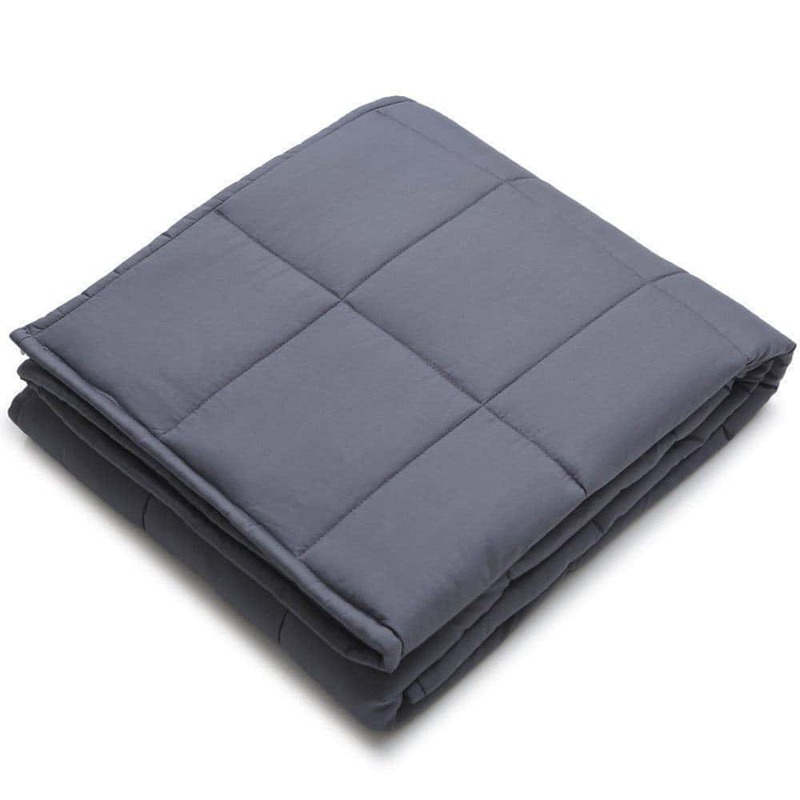 The Restorology Weighted Blanket is a great choice for a gravity blanket because it has a super soft plush material that will soothe you right to sleep. It comes in 6 beautiful color options, and 2 different lengths that are perfect for adults. One of the most high-end blankets around. This blanket by Restorology also has a removable cover so it’s easy to wash and a little more resilient to wear-and-tear. It comes in 6 weight options, ranging from 8 lbs up to 20 lbs – just the right options for you to get the perfect fit. Also, the explicitly stated 30-day satisfaction guarantee, which in the age of Amazon means little, is still a nice sign of confidence by the manufacturer. The YnM Weighted Blanket is the most customizable weighted blanket out there. It comes in a choice of 25 pretty patterns. These gravity blankets also come in over 10 different size and weight options, so yeah – long gone are the days of your run-of-the-mill blanket. You get custom, baby. This gravity blanket’s fabric duvet-style cover is quite warm, but removable. Definitely wash the cover on its own the first time, as colors may run. Overall The YnM blanket is perfect for people who enjoy patterns or for classy kids’ rooms. The YnM is perfect for people who run hot, since, without the cover, it’s actually quite thin. On top of that, it also features glass beads, which are much better than plastic at dissipating body heat. The Deep Sleep Weighted Blanket by Miran is a simple but luxurious choice for adults who have trouble sleeping. It comes in a beautiful gray minky material that feels great. Smooth and soft, unlike some of the fuzzier fleece blankets. It comes in 3 different weights: 15, 20 and 25 lbs. This gravity blanket is great for troubled sleepers. It put me to sleep very fast. It’s machine washable, and has a 2 year warranty which I think warrants the higher price point. Basically, this is just a great blanket. The ZonLi blanket is one of the largest weighted blankets you can get your hands on. It comes in a variety of sizes and colors, but the biggest measures up to 80 x 87 inches. This large size makes it a great choice for heavy users, and couples. The ZonLi weighted blanket is 100 percent machine washable, with a nicely made quilted texture. It’s 100% cotton making it light and breathable, though not as soft as some of the plush weighted blankets you can get elsewhere. Overall the ZonLi is another great option with quality fabric to give you a great nights sleep! The Weighted Idea weighted blanket is one of the best sellers because it’s an affordable price, for a high quality blanket. It comes in sizes ranging from 5 lbs all the way to 30 lbs, with tons of color options to choose from. Though these colors aren’t as exciting as some of the other brands, they certainly have a wide range to match any decor. Weighted ideas has recently upgraded their blankets, so they inner layer features cotton fabric and cotton filler. This filler type makes the blanket warm and soft to lull you right to sleep. This new filler also has small sand size pellets, and the combination of fabric and pellets make it one of the most durable weighted blankets you can get! Enjoy Your New Weighted Blanket! A word of caution: maybe if you’re considering a weighted blanket for a child, ask your doctor first? Just in case. If they don’t understand them, send them a link to this page on Facebook (share button below, wink). But I can attest that weighted blankets make great gifts for light sleepers and fussy children alike. And if you have a friend who’s a light sleeper and has fussy children, you may just save them a few gray hairs.